"We're off to see the Wizard, the wonderful Wizard of Oz." Dorothy and her friends had an epic adventure through Oz. From wicked witches to flying monkeys, the encountered just about anything you could imagine on their trip down the yellow brick road in search of Emerald City. Though Dorothy was scared to begin with, her courage grew as she continued on her journey and with every new friend she met along the way. Sounds like a lot of little girls I know – always learning and growing with the friends they make on their adventures. It's time for your little girl to make a trip to the magical land known only as Oz. Oz is a place full of magic and color that can fill anyone's imagination full of wonderful thoughts. It is also a land where someone can meet some of their greatest friends they'll ever meet. But it can also be a scary place where the only source of comfort you have is your little dog – but you know, overall, it’s a great place to be! 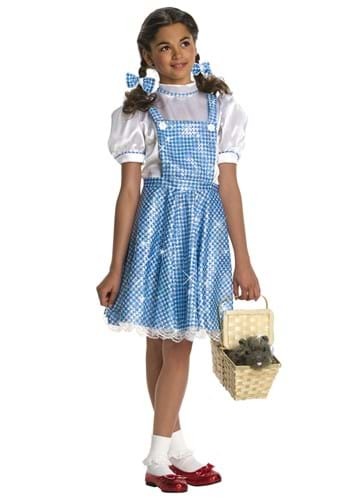 Let your daughter travel to a place that's better than any dreamland with this great sequin Dorothy costume straight out of the classic movie and story book. The 100% polyester dress is sparkly blue and white checkered and has an attached shiny white shirt. Blue hair ribbons complete this adorable, officially licensed, girl’s Halloween costume. Add a pair of ruby red slippers and a Toto in a basket for a look that will make them feel just like Dorothy.